Let me help you with the heart of your wedding day: the ceremony. I believe that each of us has a story to tell, and the journey that has brought you to this extraordinary moment, when you will commit to share the rest of your life with the person you love, is full of richness and meaning. Your Love Story is the heart of a Celebrant wedding; the story of the amazing journey that brought you together. We will collaborate to bring your story into your wedding ceremony in a way that can be heartfelt and profound, funny and delightful, and unique to you as a couple. What do you want it to be? Are you envisioning a more elaborate event, which might include a large bridal party, a procession, and rituals for you or your family? Would you like a quick, “I Do-I Do” ceremony, without the Love Story? Something in-between? Will you be having an intimate backyard event, or a large gathering at a hotel or other location? Let’s talk! How do we work together? What is the Process? When you contact me we will arrange a time to meet in person, or over the phone…or on Skype! Once we decide to work together, I’ll send you a packet which includes a Questionnaire and an Information sheet. Your responses to these become the basis of your ceremony. I’ll also provide you with many choices for vows and readings, or guide you as you write your own. And the final editorial decisions are all up to you…if you want to alter or remove something, it will be done. The heart of your wedding ceremony is the “Love Story” section, written entirely for you with information you provide in your responses to the questionnaire. 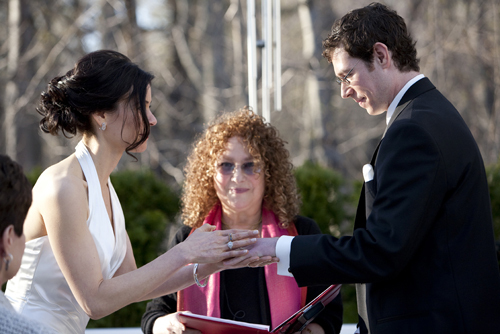 It is what makes a Celebrant ceremony particularly moving and powerful…and personal…for both you and your guests. This is your story: it can be filled with intimate detail or written more broadly, as you wish. These details are woven into other sections of the ceremony as well. Of course, if you don’t want to include this section that’s okay too. You will have the ceremony that YOU want…and we will collaborate together until it is pitch-perfect. I’m happy to provide samples of this section to you, or you can find them on the Celebrant Foundation website. Is a rehearsal required? Not always. It depends on the nature of your ceremony: If you have a large bridal party, will be having a processional or ritual, a rehearsal is required. If one is needed, it could be one or two days before the ceremony, or even a few hours before the event itself. I’ll conduct it (in concert with your wedding planner and/or venue) so that everyone–especially you–can relax. And on your wedding day I will officiate your ceremony, arriving well in advance to insure that everything is prepared, so that you can participate fully, with open heart, in the events as they unfold. Please contact me for availability, and an estimate of fees. I’ll be happy to answer any questions you have. “We were very happy with Erika’s delivery and felt like it was fate that dropped us in her lap after a series of somewhat annoying situations. Since we were legally married at City Hall in Brooklyn the week before and don’t subscribe to any religious views we wanted someone who would respect our wish to keep religious sentiment out of the ceremony. She matched our wishes, listening to our story, our belief systems and our hopes and created a beautiful (and short) ceremony. Our friends and family all remarked that our ceremony was the loveliest and most personal wedding they had ever attended. Erika allowed for moments of laughter and some reflection on those who were deceased and took our edits and requests for adjustments with grace.